Epididymitis is commonly seen in the outpatient setting in the emergency room, primary practitioner’s office, and the urology clinic. Approximately 600,000 cases of acute epididymitis are diagnosed in the USA each year (National Center for Health Statistics. Sexually transmitted disease treatment guidelines. 2010. http://www.cdc.gov/std/treatment/2010/epididymitis.htm. Accessed 6 Oct 2011). 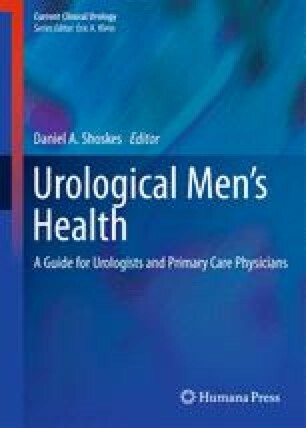 Men who have epididymitis usually present with gradual onset of scrotal pain, dysuria, urinary frequency or urgency, occasional urethral discharge, as well as fever. The combination of physical exam, history, laboratory testing, and imaging allows the physician to diagnose and treat acute epididymitis appropriately. Prior episodes of epididymitis, as well as many other scrotal content insults, have a potential to develop into chronic orchialgia or chronic scrotal content pain. Scrotal content pain is more commonly seen in the specialty setting by a practicing urologist with the patient having the complaint of chronic testicular pain. Chronic orchialgia is typically idiopathic in nature, after exclusion of reversible causes such as spermatocele, tumor, infection, varicocele, and torsion. The etiology, evaluation, and treatment for chronic scrotal content pain are not clearly described in the literature. Recent studies and review articles have better delineated chronic scrotal content pain. The majority of published literature is cohort studies with limited numbers of patients, rarely with placebo-controlled trials and without a uniform standard evaluation for these patients. National Center for Health Statistics. Sexually ­transmitted disease treatment guidelines. 2010. http://www.cdc.gov/std/treatment/2010/epididymitis.htm. Accessed 6 Oct 2011. Richman MN, Bukowski TP. Pediatric epididymitis: pathophysiology, diagnosis, and management. Medscape. http://www.medscape.com/viewarticle/410234. Accessed 6 Oct 2011.